Hawick progressed to the third round of the BT Cup after defeating the National League One joint leaders Marr at Mansfield Park to boost confidence ahead of the Premiership resumption a week on Saturday. Marr came to Mansfield Park on a nine-match winning run in National League One and in a scrappy first half the Troon side looked capable of extending that sequence to ten against a misfiring Hawick side. But after the break Hawick asserted themselves, accentuating the difference in standard between the Premiership and National One with greater physicality and structure to finish comfortable winners. Hawick coach Nikki Walker said: “We were really disappointed with the first half performance. “It was 10-6 at half time but we were really off it in the first half. In charge of Marr was the former Melrose and Scotland B player Craig Redpath, who acknowledged the big gap between the two divisions. He said: “We were a bit naive in a number of areas and they were just a bit sharper. Hawick’s chances of victory well always going to be better with the return from injury of key players Rory Hutton, who came on for the last quarter, second row Shawn Fairbairn, and flanker Andrew Horne. In addition Darcy Graham, who featured in Hawick’s in over Watsonians, continued to show his fine form, scoring two tries and constantly threatening the Marr defence. The Greens led 10-6 at the end of a difficult first half from a penalty by Ali Weir and the stand-off’s conversion of a try by Greg Cottrell from a Neil Renwick chip kick and the gather by Darcy Graham to two penalty goals by stand-off Colin Sturgeon. A determined Hawick soon extended their lead at the beginning of the second half from dynamic play that ended with Lee Armstrong scoring and Weir converting. Then Darcy Graham showed fine individual skills by chasing his own kick ahead to collect his side’s third try, Weir again adding the extras. 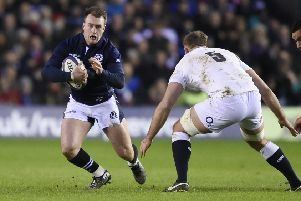 The Scotland Under-20 wing then made it a brace of tries when he came off his blindside wing to take an inside pass for a try under the posts, leaving Weir to kick his fifth goal for a perfect record off the tee.